This dish is absolutely delicious! Ive lost track as to the number of times I’ve fixed it, and shared the recipe with friends! 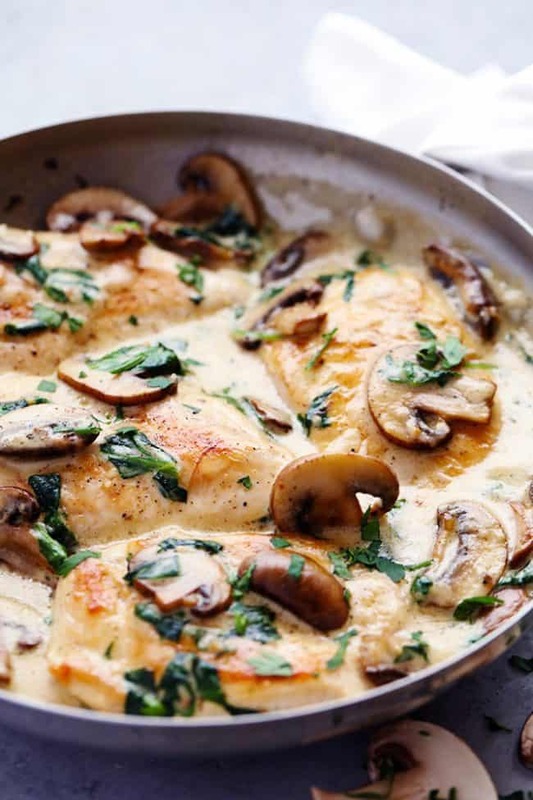 CREAMY PARMESAN GARLIC MUSHROOM CHICKEN. First of all I made this recipe last night and it was delicious! Some of my Keto friends would like to know the nutritional value, carbs and so on. Is there information available on this? Thanks! Just post the nutritional values and us Keto folks can figure out if it fits. I know for sure I will leave out the flour to make it more Keto. I know that will make the sauce thinner but that’s ok. Thank you for this! Although I love this dish and probably would make it whether it were Keto friendly or not. One of our favorites. Yes please post if you find out nutritional info 😉 Came here looking for just that. I’ve made this before & it’s SO yummy, I’m making it again tonight. I just made this tonight, it is delicious! I didn’t have spinach so I didnt add it but it was wonderful. Thank you for sharing. This looks amazing, I can’t wait to try! What did you season the chicken with? this was a major hit with the family tonight, very easy to prepare. thanks for sharing! Can I use Milk instead of cream or half and half? Chelsea, you can substitute canned evaporated(NOT sweetened condensed) milk undiluted for the cream or half & half. You can even use the lite version and still have great richness & mouth feel. Canned evaporated milk is a pantry staple in my kitchen as it was in my mom’s & paternal grandmother’s. Give it a try, be sure to shake the can well before opening. Chelsea, you can substitute canned evaporated(NOT sweetened condensed) milk undiluted for the cream or half and half. Even the “lite” version will work all while saving fat & calories. You won’t forfeit creamy richness. Canned evaporated milk should be in any pantry as a staple. The ingredient list specifies thinly sliced breast but the pieces shown and the description suggests the pieces are whole.. Are they sliced horizontally? Yes, I slice them horizontally. So yummy!! This was my first time making it. And it was easy, delicious, and I cannot wait to eat my leftovers 😋 5 stars for sure! Love this! Son and I both dislike mushrooms so I leave them out and when we don’t feel like meat we leave out the chicken too and stir fettuccine through the sauce and just eat the creamy pasta. This is very delicious thank you for sharing I wish I could upload a pic of it! OMG! Your recipes look wonderful! I’m making chicken and spinach tonight and can’t wait to try others~. Here’s my info so I can get your recipes via email! What a great recipe!! I actually tweaked it & made it into a soup! I just doubled everything in the recipe and added 4 cups of homemade chicken stock. It turned out wonderful!!! Thank you! Yes. That sounds good. Let me know how it turns out! Do you know the English measurements for this? Also, what type of pasta would you serve this with? Absolutely love this dish ❤️ Has all my favorite ingredients. And you can never have too many mushrooms. Keep those recipes coming. This dish is definitely a keeper! We loved it. The flavor is outstanding! How do I increase the serving sizes? I would like to serve atleast 6? When you say four chicken breasts, do you mean four whole breasts or four halves like are commonly sold in the grocery store? And better yet, can you tell me what the approximate weight is for the chicken? Thanks so much! Do you know the nutritional info? How many calories? Loved the recipe. I added a little chopped onion with the butter and garlic. I also seasoned the chicken with McCormick brand Montreal Steak Season. I doubles the sauce portion and served with Cork screw pasta. Everyone loved it! Delicious! I added cayenne pepper for spice and doubled the sauce recipe – perfect!! My favorite! Amazing! Easy and impressive one dish dinner! I substituted coconut milk for the cream and almond flour for the regular flour to be gluten and dairy free….and also Keto friendly. Everyone loved it. It was delicious. I topped with chopped scallions. WOW! LOVE this recipe! It is definitelly a family favorite!!! thanks!!!!! So I’ll be making this tonight. My husband has made it a couple times and we love it. I’ll be serving it over spaghetti squash however. My husband complained to me the other day we’ve been having too much pasta! Imagine that, I thought there was no such thing. So I’ll let you know how we loved it! This was sooo delicious. It would be great if you could include nutrition info with these. I put all the ingredients in a baking dish and put into the oven to finish cooking. I also added some mozzarella cheese on top I also made homemade mashed potatoes and broccoli to go with this meal. You can do so much with this chicken meal. Great recipe tastes so yummy, one of my kids favorites. This was really good!! I did rub the chicken first with some garlic paste and salt pepper garlic powder and onion powder. I’m unable to print the recipe. It always prints a blank page. Anyone else have this problem? Oh no! I am not sure why you are having a printing problem. I just tried printing it and everything worked great! Let me know if there is a problem again. Thanks for following along with me! I can’t print either. When I click on it it preview the page but never send it to the printer. I’m just going to follow it off of my phone tonight. What would you recommend as a side? A type of rice or potatoes? I am thinking along your same lines. I think any rice side or potato dish would taste fantastic! Great idea. Thanks for following along! We loved this served over cauliflower rice! Makes it more carb friendly; tho we are just trying to eat under 100 carbs a day and eat healthy and skipping all the sugar and grains possible to get weight under control and have a lifestyle we can live with long term! This dish is ohmyGAWD good!! I made it last night for Valentine’s Day as a special treat for my husaband 🙂 I made just a few tweaks here and there, like I doubled the amount of garlic the recipe calls for because I’m a an absolute fool-in-love for it, I didn’t fully cook the chicken and let it simmer in the sauce on low for 15 minutes at the end (which resulted in super tender, delish chicken), and I cooked the mushrooms in the sauce while the chicken was simmering instead of making them beforehand. What I got was the epitome of scrumptious, tender, saucy, mouth-watering goodness. My husband said it reminded him of what home should taste like. I’ll take that! 13/10 will make again!! Thank you for this out-of-this-world recipe! Oh I am so glad!! I love it when a good plan comes together! Thanks for the great comment and for sharing your feelings about the recipe. Thanks for following along! I was looking at the recipe it said to use the garlic cheese Parmesan sauce where do I find that at the store or is it in the recipe how to make the garlic cheese Parmesan sauce? This recipe has the instructions on how to make the sauce. Please let me know what you think. I would love to hear! Thanks for following long with me. Nutritional information would be amazing!!! I like to use myfitnesspal.com or skinny taste.com to help with any nutritional questions. The question was serving size, not how many servings. 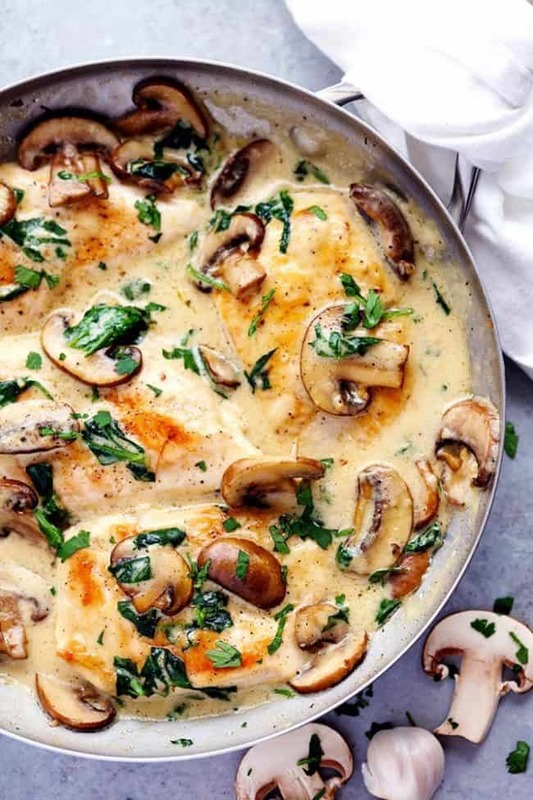 I tried this recipe and used milk instead of half and half or cream because I didn’t have any and I also didn’t use mushrooms or garlic because I forgot all that at the store lol but it turned out great! 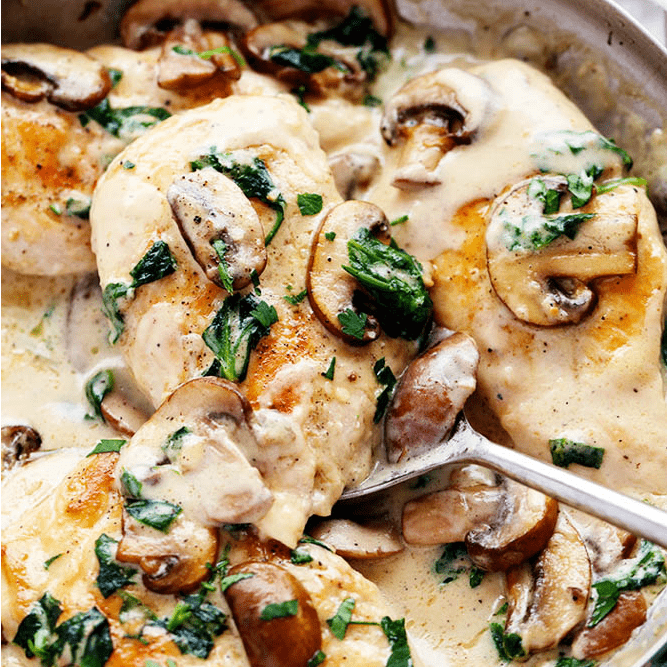 Almost like a creamy gravy chicken and the sauce is think! Thank you for sharing! Can you make this ahead and freeze ?? Yes, this is a great meal to freeze! For those of you who may be interested in a substitute for cream or half and half, try canned evaporated(NOT sweetened condensed) milk undiluted. You can even use a “lite” version. You won’t be forfeiting creamy richness. Give it a try. Always a pantry staple at my house. This is guest worthy. I did add more mushrooms just because of our liking. Why do you use fresh garlic & garlic powder? Couldn’t you just use a couple of more garlic cloves? Yes, garlic cloves would work great with this meal too. This is a family favorite. One of our most made dishes! We serve over spaghetti squash. (If you do this- do not package up leftovers in the same dish as the spaghetti squash tends to be watery when stored). So yummy! Thanks for sharing! 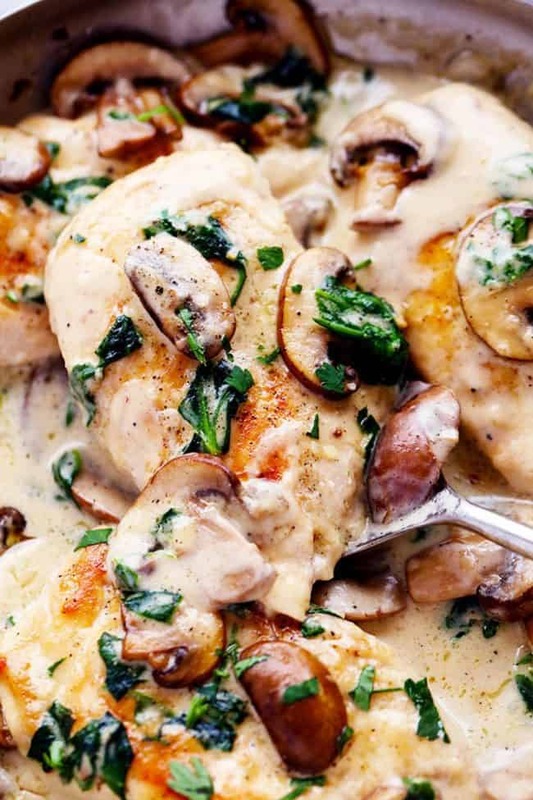 Creamy parmessan chicken is decadent and delicious, thank you! 30 Minutes?? To slice the chicken, wash and slice the mushrooms, chop the spinach, mince the garlic, grate the parmesan and measure the remaining ingredients? Plus 15 minutes of cooking time = nope! BUT is it worth every single moment it takes to make this? YES! It is fantastic!! Thank you so much! I love this recipe, but used left over roast chicken, (or would use thighs as moister) and also substituted coconut cream instead of cream. Its really a wow….. my hubby loved it…. thanks for d delicious recipe. I have made this many times and is even better the next day. I substituted the spinach for frozen peas. I always double the recipe and I use 2 kinds of mushrooms, white button mushrooms and small bella mushrooms. A famiy favorite!